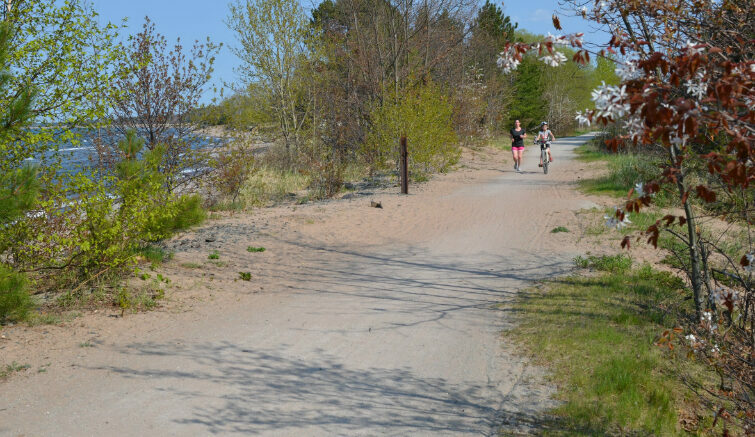 LANSING — Sixteen projects along Michigan’s Iron Belle Trail will share $350,000 in grant funding through awards announced today by the Michigan Department of Natural Resources. For this third round of Iron Belle Trail funding, the DNR received 41 applications. Each funded project will receive an amount up to $30,000, for improvements that include feasibility studies, preliminary construction and engineering of new trail segments, signage for trail segments and trailheads, environmental impact studies and other uses. Michigan’s Iron Belle Trail is the longest state-designated trail in the nation, encompassing more than 2,000 miles of Michigan on hiking and biking routes, allowing users to explore pristine forests and cool rivers while connecting big cities to smaller and diverse towns. The trail extends from Belle Isle in Detroit to Ironwood in Michigan’s western Upper Peninsula. This is the third year of grants issued specifically for Iron Belle Trail development. The DNR awarded $250,000 in 2015 and $350,000 in 2016 for various projects, many of which have been completed or are nearing completion. This year’s funds were part of the department’s 2017 budget for the non-motorized trail program. -Michigan Department of Transportation (Genesee County) – $25,000 for preliminary engineering for the Iron Belle Trail along M-15 from Hegel Road in Goodrich to County Line Road in Atlas Township in southern Genesee County. -North Country Trail Association (Ontonagon and Gogebic counties) – $4,200 for four separate informational panels at trailheads or other parking areas near the North Country National Scenic Trail and the Iron Belle Trail. The panels will be designed to showcase Michigan’s Upper Peninsula and highlight areas of interest along the trail. -North Country Trail Association (Luce County) – $17,050 for improvements of five trail sections around Wolf Lake in the Upper Peninsula. -Ottawa Forest (Ontonagon County) – $30,000 toward the Bush Creek Bridge replacement in the Ottawa National Forest. -City of Grand Blanc (Genesee County) – $18,900 for preliminary engineering, route planning and construction assistance for shared lane pavement markings and sign purchase and installation. -Arenac County – $25,000 for development of conceptual drawings and construction estimates for a 7-mile trail segment between the city of Omer and the city of Au Gres. -City of Saginaw (Saginaw County) – $21,468 to hire an engineering firm to complete a topographical survey and cost estimates for a 1.84-mile segment between East Avenue and Forney Street. -Southern Links Trailway (Genesee, Lapeer and Tuscola counties) – $10,000 toward the purchase and installation of 30 Iron Belle Trail identification signs, including hardware and information kiosks at three trailheads along the 10.2-mile stretch between Columbiaville in Lapeer County through Otter Lake in Genesee County to Millington in Tuscola County. -City of Burton (Genesee County) – $7,282 to pay for preliminary engineering along the proposed 1.7-mile stretch between Burton and Grand Blanc Township. -Crawford County – $25,000 for preliminary engineering of the segments between Kirtland Community College and the city of Grayling. -Roscommon County – $30,000 to help fund a feasibility study, preliminary engineering and land acquisition assessment on a proposed 22-mile stretch through Roscommon County. -Southwest Detroit Business Association (Wayne County) – $30,000 to survey, design and engineer the Southwest Detroit Greenlink from Woodmere Cemetery to the Fort Street Bridge. -Downriver Linked Greenways (Wayne County) – $21,100 for a signage project that includes the purchase of 200 Iron Belle confidence markers, three signage kiosks and interpretive panels and 50 on-pavement markings. These will be installed along the 25-mile length of the Iron Belle Trail through 10 communities in the Downriver region of southeast Michigan. -Orion Township (Oakland County) – $25,000 for design completion for the Clarkston Road Regional Pathway Connection Project, Phase II, from Thistle Valley Lane to the Polly Ann Trail. -Van Buren Township (Wayne County) – $30,000 for preliminary engineering of a 2.5-mile segment following Huron River Drive from Belleville to Haggerty Road. -GEI Consultants (Iron County) – $30,000 for a feasibility study to connect the east and west segments of the Iron Belle Trail and the Iron County Heritage Trail. Learn more about the Iron Belle Trail at the DNR website www.michigan.gov/ironbelle.